Shu-Yin's Sanctuary: Is That A Ball Underneath My Clothes? It certainly looks like there is a ball hidden underneath my clothes. I posted this photo on Facebook yesterday and there were so many people commenting on it. One told me my 'Lil Bub is having Euro Fever. Lol. Anyway, I'm 55.5kg today according to my gynae's scale and I've only gained ~5kg. So doctor told me I can gain some more, no problem. But Lil Bub is a little big-sized. Uh oh! Sigh...must be Lil Bub ate all my food. He ate all my sushi and nasi kandar and haagen-dazs! But I am feeling great at this moment. Besides the feeling of carrying a football underneath my clothes 24/7, I've got no swollen feet yet. So walking is still OK for me. Appetite is great and everything is my palate now. No cravings so Hubby should thank his lucky stars. 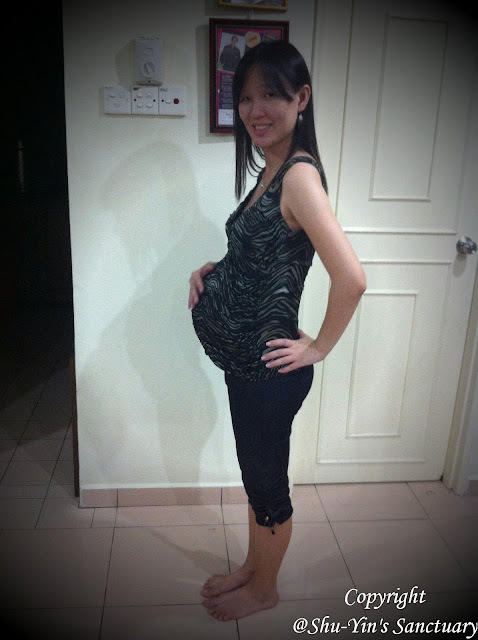 That's all for now for the first pregnancy update for the 3rd Trimester for Baby#2!